There is an inverse relationship between quantity demanded and its price. The people know that when price of a commodity goes up its demand comes down. When there is decrease in price the demand for a commodity goes up. There is inverse relation between price and demand . The law refers to the direction in which quantity demanded changes due to change in price. A consumer may demand one dozen oranges at $5 per dozen . He may demand two dozens when the price is $4 per dozen. A person generally buys more at a lower price. He buys less at higher price. It is not the case with one person but all people liken to buy more due to fall in price and vice versa. This is true for all commodities and under all conditions. The economists call it as law of demand. In simple words the law of demand states that other things being equal more will be demanded at lower price and lower will be demanded at higher price. Paul A. Samuelson says that law of demand states that people will buy more at a lower prices and buy less at higher prices, other things remaining the same. There is no change in income of consumers. There is no change in the price of product. There is no change in quality of product. There is no substitute of the commodity. The prices of related commodities remain the same. There is no change in customs. There is no change in taste and preference of consumers. The climate and weather conditions are same. The tax rates and other fiscal measures remain the same. The relationship between price of a commodity and its demand depends upon many factors. The most important factor is nature of commodity. 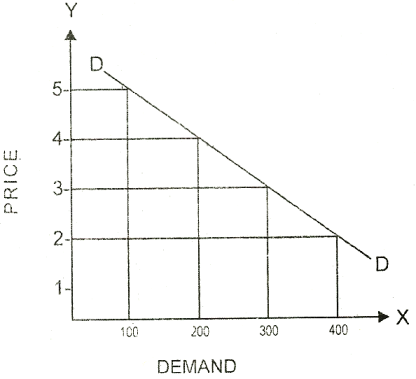 The demand schedule shows response of quantity demanded to change in price of that commodity. This is the table that shows prices per unit of commodity ands amount demanded per period of time. The demand of one person is called individual demand. The demand of many persons is known as market demand. The experts are concerned with market demand schedule. The market demand schedule means 'quantities of given commodity which all consumers want to buy at all possible prices at a given moment of time'. The demand schedules of all individuals can be added up to find out market demand schedule. Price in dollars. Demand in Kg. The table shows the demand of all the consumers in a market. When the price decreases there is increase in demand for goods and vice versa. When price is $5 demand is 100 kilograms. When the price is $4 demand is 200 kilograms. Thus the table shows the total amount demanded by all consumers various price levels. There is same price in the market. All consumers purchase commodity according to their needs. The market demand curve is the total amount demanded by all consumers at different prices. The market demand curve slopes from left down to the right. When a consumer buys more units of a commodity, the marginal utility of such commodity continue to decline. The consumer can buy more units of commodity when its price falls and vice versa. The demand curve falls because demand is more at lower price. When there is increase in price of commodity, the consumers reduce the consumption of such commodity. The result is that there is decrease in demand for that commodity. The consumers consume mo0re or less of a commodity due to price effect. The demand curve slopes downward. Real income of consumer rises due to fall in prices. The consumer can buy more quantity of same commodity. When there is increase in price, real income of consumer falls. This is income effect that the consumer can spend increased income on other commodities. The demand curve slopes downward due to positive income effect. When the price of a commodity falls, the prices of substitutes remaining the same, consumer can buy more of the commodity and vice versa. The demand curve slopes downward due to substitution effect. The income of people is not the same, The rich people have money to buy same commodity at high prices. Large majority of people are poor, They buy more when price fall and vice versa. The demand curve slopes due to poor people. There are different uses of many goods. When prices of such goods increase these goods are put into uses that are more important and their demand falls. The demand curve slopes downward due to such goods. The law of demand does not apply in case of inferior goods. When price of inferior commodity decreases and its demand also decrease and amount so saved in spent on superior commodity. The wheat and rice are superior food grains while maize is inferior food grain. The law of demand does not apply in case of diamond and jewelry. There is more demand when prices are high. There is less demand due to low prices. The rich people like to demonstrate such items that only they have such commodities. The consumer usually judge the quality of a commodity from its price. A low priced commodity is considered as inferior and less quantity is purchased. A high priced commodity is treated as superior and more quantity is purchased. The law of demand does not apply in this case. The law of demand does not work when there is less supply of commodity. The people buy more for stock purpose even at high price. They think that commodity will become short. The law of demand does not work during period of depression. The prices of commodities are low but there is increase in demand. it is due to low purchasing power of people. The law does not apply in case of speculation. The speculators start buying share just to raise the price. Then they start selling large quantity of shares to avoid losses. The law of demand is not applicable in case of goods out of fashion. The decrease in prices cannot raise the demand of such goods. The quantity purchased is less even though there is falls in prices. A monopolist can determine price of a commodity on the basis of such law. He can know the effect on demand due to increase or decrease in price. The demand schedule can help him to determine the most suitable price level. The law of demand is important for tax authorities. The effect of tax on different commodities is checked. The commodity must be taxed if its demand is relatively inelastic. A commodity cannot be taxed if its sales fall to great extent. The law of demand is useful to determine agricultural prices. When there are good crops, the prices come down due to change in demand. In case of bad crops, the prices go up if demand remains the same. The poverty of farmers can be determined. Individual demand schedule is used in planning for individual goods and industries. There is need to know the effect of change in price on the demand of commodity at national and world level. The nature of demand schedule helps to know such effect.